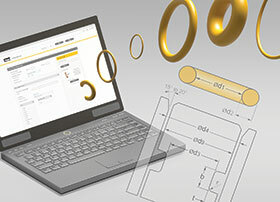 The Engineered Materials Group of Parker Hannifin has announced the availability of a new web-based engineering tool: the Parker O-Ring Selector. The innovative tool enables precise selection of the right O-ring material and seal size according to the user’s application conditions. Close interlinking of material and size selection delivers reliable results ensuring the desired performance of the O-ring in the subsequent application. Both imperial and metric standards are covered. The selector combines a wide range of sealing materials with a calculation platform for O-ring seals. The selection of materials takes operating temperatures, fluids relevant to the sealing application, the polymer family and seal hardness, as well as required approvals and conformances into account. The data set of the material that has been characterised this way is subsequently fed into the actual selection of the sealing system. In this step, the tool offers the user extensive options to parameterise the sealing system such as thermal expansion coefficients of the seal and the hardware components, volume swelling of the seal and manufacturing tolerances for the hardware components. In addition to the delivery of reliable results, ease of use was a key objective in the development of the application. The three-part structure, divided into ‘Service Conditions & Material Selector,’ ‘Size Selector’ and ‘Notes’ as the main sections, is logical and clearly arranged. The selector is available to all interested users at www.parker.com/o-ring-selector in an English language version. Other languages will follow at a later date.